Here are some tips on manually locating some of the most popular galaxies in the Messier Catalog. M31 (NGC 224), the Andromeda Galaxy, is a large Sb spiral galaxy (apparent size=185x75 arc minutes) and a member of the Local Group, as is our home galaxy, the Milky Way. It is the brightest of the Messier galaxies (magnitude=3.4, surface brightness=13.6 magnitudes per square arc minute) and the brightest galaxy visible to most northern hemisphere observers. M31 is best seen in the fall and early winter. 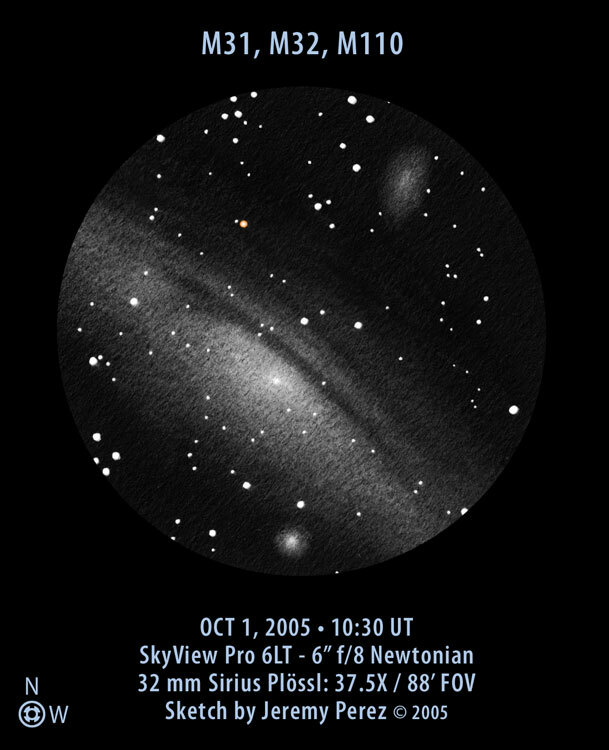 The Andromeda Galaxy can be seen without optical aid from reasonably dark sites. From light-polluted urban locations, only the core of the galaxy is visible when viewed through a telescope. M31 has four dwarf galaxy companions. Two of them, M32 (NGC 221) and M110 (NGC 205) are in close proximity. M32, a cE2 compact elliptical galaxy, is due south of M31's nucleus. M110, an E5 peculiar galaxy, ls located northwest of M31. M32 and M110 are the nearest bright elliptical galaxies. Much farther away in Cassiopeia lie NGC 147 and NGC 185, types dE5 peculiar and dE3 peculiar, respectively. It is possible to observe M31's dust lanes and other features such as globular clusters and stellar associations telescopically under very dark skies. NGC 206 is a vast star cloud similar to but larger than M24. Mayall II (M31-G1) is M31's brightest globular cluster. 2. Follow the apex of the triangle formed by Schedar (Alpha Cassiopeiae), the southernmost star in Cassiopeia, and the neighboring stars Caph (Beta Cassiopeiae) and Navi (Gamma Cassiopeiae), southwestward for just over fifteen degrees. 3. Use Mirach and Alpheratz to form a near right triangle with M31. M31 lies not quite eight degrees to the northwest of Mirach and approximately fourteen degrees to the northeast of Alpheratz. Browse http://www.skyhound....e/oct/M_31.html and http://messier.seds.org/m/m031.html for further information on M31. M33 (NGC 598), the Triangulum Galaxy, is another galaxy that many amateur astronomers are interested in observing. M33 is a type Sc face-on spiral galaxy with a rather high integrated magnitude of 5.7 but a very low surface brightness of 14.2 magnitudes per square arc minute, making it sometimes rather difficult to discern through a telescope, especially if any significant light pollution or moonlight is present. However, M33 can be seen with the naked-eye from a very dark site and is a relatively easy binocular target under dark skies. The fall and winter are the best times of year to observe M33. M33 is approximately the same distance - seven degrees - to the southeast of the second-magnitude star Beta Andromedae (Mirach) as M31 is to the northwest. The Triangulum Galaxy lies 4.3 degrees northwest of the third-magnitude star Alpha Trianguli (Mothallah). One method of locating it is to start at Alpha and go 2.5 degrees west to the sixth-magnitude star HIP 7906. The seventh-magnitude star HIP 6862 is situated 3 degrees farther west. M33 lies a bit north of a line connecting these two stars and is closer to HIP 6862, the fainter star. M51 (NGC 5194, integrated magnitude=8.4, surface brightness=12.6 magnitudes per square arcminute), a type SA(s)bc pec face-on spiral galaxy, and its irregular companion M51b or NGC 5195 (magnitude 9.6, surface brightness=13.1 magnitudes per square arcminute) are perhaps the most prominent example of an interacting pair of galaxies. They are best seen in the spring. Due to the work of Lord Rosse In 1845, M51 was the first galaxy to be recognized as having a spiral shape. Of course, M51 was merely a "nebula" at that time, which was long before galaxies were determined to be objects external to the Milky Way. M51 and NGC 5195 may be part of the M101 group of galaxies. Three supernovae have occurred in M51: SN 1994I, SN 2005cs, and SN 2011dh. To star-hop to the Whirlpool Galaxy, proceed southwest from Alkaid (Eta Ursae Majoris), the final star in the Big Dipper's handle, to the fifth-magnitude star 24 Canum Venaticorum. Continue southwest to an isosceles triangle of seventh-magnitude stars. M51 and NGC 5195 lie just to the south of the triangle, approximately 3.5 degrees from Alkaid and 1/4 of the way to Cor Caroli (Alpha Canum Venaticorum). M81 (NGC 3031) and M82 (NGC 3034) are two bright galaxies in the northwestern section of Ursa Major. M81, a type Sb spiral galaxy, has an integrated magnitude of 6.9 and a surface brightness of 13.0 magnitudes per square arcminute. M82, a type Ir II irregular galaxy, shines at magnitude 8.4 and has a slightly brighter surface brightness of 12.8 magnitudes per square arcminute. M81 and M82 were discovered by the German astronomer Johann Bode on December 31, 1774. Together they are sometimes known as Bode's Nebulae. To locate this galactic pair, pan from "above" Dubhe (Alpha Ursae Majoris) towards the "front" of Ursa Major. The next fairly bright star is 23 Ursae Majoris (magnitude 3.5). To the northwest of 23 Ursae Majoris lies a moderately bright isosceles triangle of stars consisting of Sigma 1 and Sigma 2 Ursae Majoris and Rho Ursae Majoris. Northeast of the triangle is 24 Ursae Majoris, which shines at magnitude 4.5. 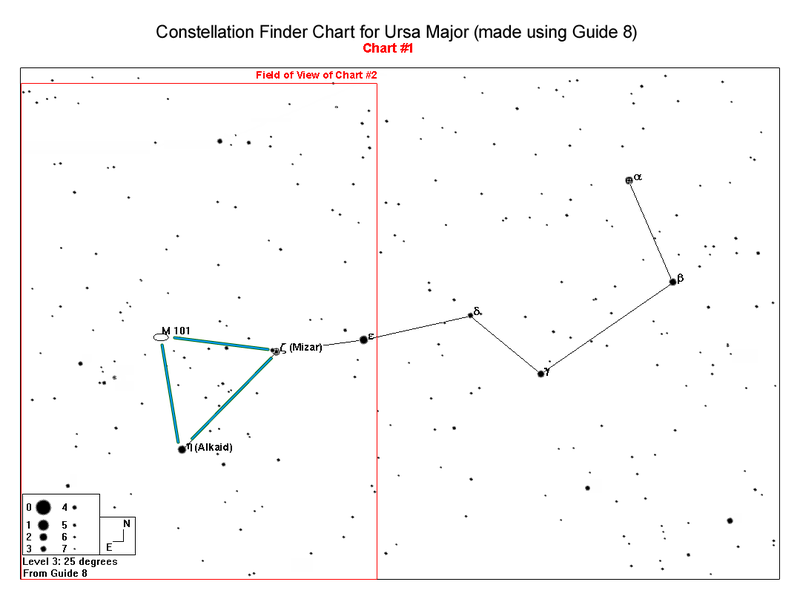 Southeast of 24 Ursae Majoris is a magnitude 5.7 star. M81 is immediately to the southeast of that star. M82 is situated about 2° southeast of 24 Ursae Majoris and just 38 arc minutes, a bit more than the width of a Full Moon, to the north of M81. Extending a line from Phecda (Gamma Ursae Majoris) to Dubhe the same distance beyond Dubhe places one approximately one degree south of M81. M81 and M82 are the major members of the M81 group, which is one of the closest galactic congregations beyond the Local Group. NGC 2976 and NGC 3077 are two other member galaxies that are good targets. M101 (NGC 5457), the Pinwheel Galaxy*, is a type Sc face-on spiral galaxy with an integrated magnitude of 7.9 and a very low surface brightness of 14.8 magnitudes per square arc minute, the lowest of all the Messier galaxies. Because of this fact, M101 is often a difficult target for amateur astronomers observing from less-than-dark sites. However, from a good dark site, this "grand design" spiral galaxy is fairly easy to detect through binoculars. A number of eleventh-magnitude and fainter companion galaxies surround M101. The M101 group is also likely to include the M51 group to the southeast and possibly the NGC 5866 group to the northwest. * Unfortunately, M33 and M99 are also sometimes called the Pinwheel Galaxy. ** Mizar and Alcor are actually a sextuple star system. M104 (NGC 4594), commonly known as the Sombrero Galaxy, is one of the easiest-to-see galaxies in the Virgo Cluster. This type SA(s)a spiral galaxy shines at magnitude 8.0 and has the highest surface brightness (11.6 magnitudes per square arc minute) of all the Messier galaxies. How does one go about star-hopping to the Sombrero? It's actually quite simple. Approximately 2.5 degrees to the northeast of Delta Corvi (Algorab) is a triangle of fifth and sixth-magnitude stars that points to the Stargate asterism. The Stargate is also triangular in shape and, in turn, points to an asterism to the northeast known as Jaws. Jaws lies 25 arc minutes west-northwest of M104. The brighter stars in Jaws point directly at the Sombrero Galaxy. An alternative method of locating M104 is by following a line of fifth and sixth-magnitude stars heading northeastward from Gamma Corvi (Gienah). Click on http://www.deepskyvi...ero_galaxy.html for a short video on M104. That's a load of useful information Dave, thanks. Thanks for taking the time to put all that together. There is a lot of good information there. A good way to hunt for these objects is start with some binoculars, not necessarily to see the objects themselves but to get a better view of the area of interest. From my urban backyard, M31, M51, M104 and M81-82 are doable, I leave M33 and M104 to dark skies where both are visible in 40-50mm binoculars. Thanks Dave! I still have yet to get M101 and I have not tried M104, didn't know that one was so accessible until now. They are on my list now for when they get up high enough! Thank you, this is very helpful since I'm just starting out. Edit: That link worked on the forum where I originally posted the information on M31 but not here. I've incorporated it into the final sentence in the first paragraph. This is super helpful, Dave. Thank you! I'll use this next night out -hopefully this weekend. Some great information there, Very useful Nice one! I as well have yet to glimpse M101 or M104, using the info you have provided has re-energized my desire. Thanks, this is a real good source of information & I'll be using this in the near future. I'll never forget one of my first attempts at finding deep sky objects about 35 years ago involved positioning the scope to the specified celestial coordinates by using the setting circles on the equatorial mount without knowing much about the object itself. I got a good laugh when the scope ended up being pointed down to the ground for one of the objects I was hunting for that night! Cant wait to put this to use, thanks for putting it together. I was trying my best to find Andromeda last night, but seeing conditions, and perhaps my inexperience, just werent working with me. While not a galaxy, I did manage to find M57(Ring Nebula) and M29(Open Cluster) which I suppose qualify as my first DSOs. My scope is a homemade 6" f8 Newt whose mirror I ground and figured. M104 was the first galaxy I found, because M31 was too low in the sky. The "Jaws" and M104 lined up so I was able to confirm the smudge I was seeing was M104. I live in a blue zone, with a fairly bright Milky Way, but M101 is my bugbear. I know EXACTLY where it is (plotted a finder sheet with Eye & Telescope), but I can't see anything at all there with 7x50 binoculars. The best I can do is to point the scope in the direction of M101 on a really dark night, and look for a faintly lighter smudge where I know it is. Then, if I rotate the scope about 1/4 degree, and the smudge doesn't move, I know I've found it. Messier must have had really dark skies. What does that say about mine? Thanks Dave, for all this info. No wonder M101 has eluded me! I'll pick on the easier targets for early success with my scope, an Apex 90 with Antares ALP nebula filter. M101 is hard to see without a very dark sky. I lived in Upstate NY and my sky was moderately dark (35 years ago) and it was not really easy in a 6"f8. I did take the scope to the bush in Quebec and I could see it pretty easily. But yes it is challenging if your sky isn't really dark. 1: Galaxies are really faint. They're really hard or impossibe to see in light-polluted skies. To combat this, aperture and dark skies are your friends. Either one helps. 2: Binoculars and good dark skies may be the best combination for finding galaxies. –The wide view helps locate galaxies quickly by star-hopping. Big aperture telescopes are great, but are more difficult to scan through swaths of sky. 3: Short focal length scopes on an Alt/Az mount are more useful for hunting galaxies. If you're lucky enough to have a large aperture fast scope, USE IT. If you're on a budget, dark skies are free if you simply go to them. Under dark skies, even a small aperture fast scope is a good galaxy-hunter. 4: Have patience. Andromeda is one of the easiest to find because of its size. If you're just starting out, try for it first. Have plenty of time to let your night-vision adjust. Averted vision may be necessary to see a galaxy. 5: I suppose computer guided mounts would make locating galaxies easier, but in practice I've been more successful using a starchart and star-hopping. If you're going to do that with a scope (in addition to binoculars to help you hunt), you want a Right Angle Correct Image (RACI) finder scope, and probably a correct-image prism diagonal for your scope for scanning. Once you've zeroed in on your galaxy, you can switch over to a mirror star diagonal for better viewing if you like. There is nothing more maddening that trying to mentally switch back and forth between a star chart and a reversed left-right or upside-down view for star-hopping with a scope. A Telrad finder and chart are probably great galaxy-hunting tools as well, although I've not used one. 6: You'll probably find a lot of other interesting stuff while you galaxy hunt. There's nothing like sitting on one patch of sky for finding low-earth-orbit satellites and bright double-stars. Plan on spending some extra time viewing nearby interesting objects to keep your galaxy-hunting nights interesting. I've had more nights where I was not successful finding galaxies I was hunting (due to light pollution), so having secondary targets makes your time under the stars worthwhile. Very new here and this is great. Can't imaging not being able to sort any issues out in the future with this forum available. Great information. I am trying the Messier Objects with a 72mm refractor. It has been a challenge but very rewarding. Thank you Dave for taking the time for putting the info together. Again, thank you for taking the time to put this info together. Presented for your enjoyment and edification are the following tips that may provide some assistance to those who are just starting out in amateur astronomy. Nightwatch: A Practical Guide to Viewing the Universe by Terence Dickinson is considered by many to be the single best book for novice amateur astronomers. As far as other beginning observing guides are concerned, I highly recommend Phillip S. Harrington's Star Watch: The Amateur Astronomer's Guide to Finding, Observing, and Learning About over 125 Celestial Objects and Turn Left at Orion: A Hundred Night Sky Objects to See in a Small Telescope--and How to Find Them by Dan M. Davis and Guy Consolmagno. Another out-of-print guide that's worth looking for is Deep-Sky Observing with Small Telescopes by David Eicher. At a more advanced level, The Backyard Astronomer's Guide by Terence Dickinson and Alan Dyer is an excellent guide to astronomy and amateur astronomy. Another very good, yet inexpensive, source of general information is A Field Guide to the Stars and Planets (Peterson Field Guides) by Jay M. Pasachoff. Yet another is Stars and Planets: The Most Complete Guide to the Stars, Planets, Galaxies, and Solar System - Updated and Expanded Edition (Princeton Field Guides) by Ian Ridpath and Wil Tirion. The Observer's Sky Atlas: With 50 Star Charts Covering the Entire Sky by Erich Karkoschka and Objects in the Heavens by Peter Birren are two inexpensive but very handy field guides. For more advanced observers, The Night Sky Observer's Guide is the best one currently available. As far as books on astronomy gear are concerned, the final edition of Phil Harrington's Star Ware: The Amateur Astronomer's Guide to Choosing, Buying, and Using Telescopes and Accessories is now somewhat dated but still contains some excellent information. Astronomy Hacks by Robert Thompson and Barbara Thompson is another highly-recommended book full of great tips on equipment and the art of observing. For recent reviews of astronomy equipment, the periodical Astronomy Technology Today is a good source. One of the finest books, in my opinion, on learning how to star-hop is Alan MacRobert's Star-Hopping for Backyard Astronomers, which, unfortunately, is no longer in print. Active observers will eventually need a good beginning star atlas in order to locate various stars and deep-sky objects or DSOs. Paper star atlases run the gamut from the simple and inexpensive to the complex and costly. Here are a few to consider: Orion's DeepMap 600, Norton's Star Atlas and Reference Handbook, 20th Edition by Ian Ridpath (Editor), Sky & Telescope's Pocket Sky Atlas and Pocket Sky Atlas – Jumbo Edition by Roger W. Sinnott, the Bright Star Atlas 2000.0 by Wil Tirion and Roger W. Sinnott, and The Cambridge Star Atlas by Wil Tirion. The Sky Atlas 2000.0 by Wil Tirion is a more advanced and expensive atlas. The two volume Uranometria 2000.0 goes even "deeper" in stellar magnitude and displays the positions of a greater number of deep-sky objects. The newest high-end star atlas is the interstellarum Deep Sky Atlas. Free worthwhile planetarium apps include Sky Portal, Star Chart, and Star Walk. SkySafari is an excellent planetarium program and much more that is available in a freeware version, as well as two commercial versions. Browse https://freestarchar...ssier-catalogue for finder charts for the 110 objects in the Messier Catalog. The Telrad is a very handy 1x (non-magnifying) reflex sight finder. Binoculars are a great way to get started in observational amateur astronomy. These instruments are relatively inexpensive and are eminently portable and easy to use. Using both eyes definitely adds to the visual experience. Binoculars are ideal for showing the "big picture". They can readily display objects that are too large to fit into the fields of view of most telescopes. In addition, binoculars can often be useful in "surveying" the area where an object is located prior to conducting a telescopic star-hop. A surprising number of celestial objects, including many binary stars, open and globular star clusters, nebulae, and some of the brighter galaxies, can be detected with binoculars. Scanning through the heart of the Milky Way with a binocular from a very dark site is a very memorable experience. I recommend purchasing a 10x50 (i.e., 10 power and 50mm aperture) binocular for astronomical use. A 10x50 binocular is usually not overly heavy for most people to hand-hold and provides a 5mm exit pupil that will be appropriate for most observers when age and observing site darkness are taken into account. People who must wear eyeglasses while observing may want to look for a binocular with at least 14mm of eye relief. Most binoculars are made in China nowadays and are sold by a variety of vendors under a host of different brand names. Some of them have surprisingly good optics. Celestron, Nikon, Orion, and Pentax are good mid-price brands to consider. In my opinion, the best binocular observing guidebooks currently available are Touring the Universe through Binoculars: A Complete Astronomer's Guidebook by Phil Harrington, Binocular Astronomy by Craig Crossen & Wil Tirion, Binocular Highlights: 99 Celestial Sights for Binocular Users by Gary Seronik, and Observing the Night Sky with Binoculars by Stephen O'Meara. Monthly lists of binocular deep-sky objects can be found in my Celestial Calendar in the Celestial Events section of Cloudy Nights. The vast majority of deep-sky objects visible in amateur telescopes are quite faint and are best seen from a dark location. Stargazing from light-polluted locales can be quite challenging. However, there are a number of DSOs that can be seen by urban observers. The Moon, the bright planets, bright binary stars, bright open and globular clusters, bright nebulae, and bright galaxies are all possible targets. Light pollution and nebula filters may be useful to some degree on certain nebulae. However, the rising use of broadband LED lighting renders such filters ineffective. Books on the subject include Urban Astronomy by Denis Berthier and The Urban Astronomer's Guide: A Walking Tour of the Cosmos for City Sky Watchers (Patrick Moore's Practical Astronomy Series) by Rod Mollise. A wealth of good astronomy freeware is listed here and here. Stellarium, Cartes du Ciel, and C2A are all fine freeware planetarium programs. Celestia is a simulator program. The Virtual Moon Atlas is a great aid for lunar observing. A number of surprisingly good free astronomy apps - https://www.hongkiat...targazing-apps/ and https://ioshacker.co...onomy-apps-2017 - are also available. There are also many excellent commercial planetarium programs on the market, including MegaStar, SkyMap, Sky Safari, Sky Tools, Starry Night, and TheSky. Thanks for the great advice! I love the backyard astronomer's guide! I just picked up star hopping for backyard astronomers on amazon for under $3.00.